Clean Your Plate is a cookbook and guide to making healthy, simply delicious meals on a budget and what home doesn’t want that? Whether you are looking to slim down, prevent disease or just feel better and have more energy, Clean Your Plate can help make the trek to healthy eating simple and delicious with recipes built around the elimination of refined sugars, processed foods and chemicals. Put it under the tree as a gift for every member of the family. A personalized phone dock by Kitchen Niche makes a great gift for anyone as it is completely customizable. Submit your favorite image, write out a special note for the back and then sit back and watch as this functional gift becomes their favorite gift. Root & Roam is a subscription box specifically for the home. Gift one month or a whole year worth of boxes and give the gift of a well curated home for all to enjoy. Smith Crafted Woodworks specializes in wood decor for the home and this beautiful 24" wooden clock with carved roman numerals is certainly a statement piece. Offered in a variety of finishes including hickory, cedar, white and charcoal gray (cedar is pictured), each clock can also be customized and personalized making it the perfect gift this holiday season. Have a foodie to buy for? Foodie Dice provides inspiration for creating simple, seasonal meals. Simply select the five primary dice, add a seasonal veggie die and roll. Then shop, cook, and eat! Over 186,000 possible meal combinations to inspire creativity in the kitchen. 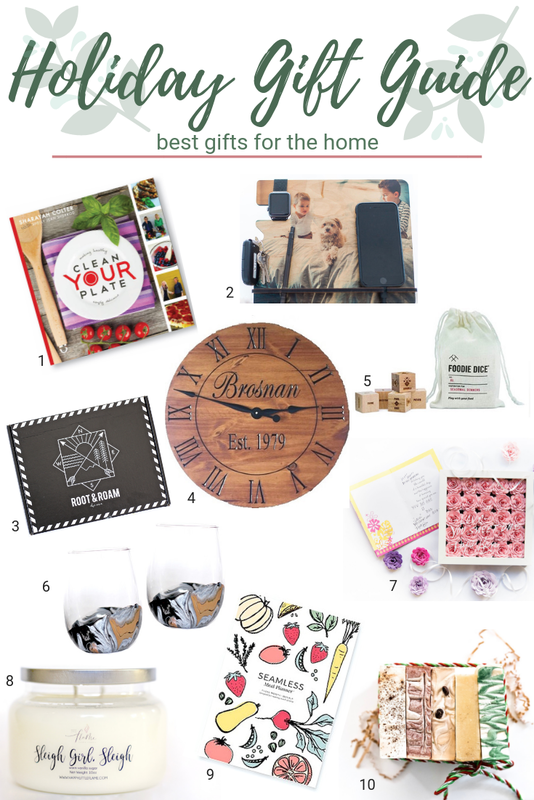 Evergreens + Cocoa has you covered when it comes to shopping for the wine and coffee lovers on your Christmas list this year. A set of these handmade marbled stemless wine glasses or mugs adds the perfect touch to any kitchen. A personalized handwriting shadow box by The Scarlett Butterfly is the perfect way to remember loved ones that are no longer here or to just remind someone special how much you love them. Made with up of 25 gorgeous hand rolled paper flowers, each frame displays the handwriting of your loved one to be cherished forever. The Seamless Meal Planner helps busy families plan and organize a week of meals through inventory based prompts that save money, time, and stress, making it the best gift ever. Handmade from family recipes in small batches, Sneedsboro Soap Co.’s scents are everything you love about the holiday season. The gift set includes all 5 of the holiday edition natural bar soaps: Walk In The Woods, Almond Espresso Cookie, Apple Cider, Pumpkin Pie and Christmas Presence, but, as always, does not contain artificial colors, detergents, parabens, SLS, or pre-made soap bases. A win for your nose and a win for your health. Head to Instagram to see many of these beautiful products in use.